The Fiery Furnaces are my favorite new band to emerge this year. The music of The Fiery Furnaces is a mix of garage-rock, blues, and folk, yet it sounds like none of the above. 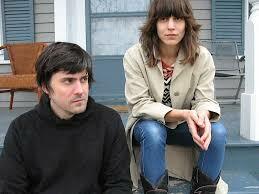 The duo is Eleanor Friedberger (vocalist / guitarist) and Matthew Friedberger (guitarist / keyboards / vocals). The sister and brother were born and raised in Chicago but soon moved to Brooklyn, where they formed different incarnations of the Fiery Furnaces, with other members. They played some early shows at Enid's and things started to happen. The group played around NYC for a couple of years. They supported bands including The Kills, French Kicks, Spoon and Hot Hot Heat. Soon, with their strong word of mouth reputation, they secured a deal with Rough Trade. They released their debut single "Crystal Clear" in fall 2003. A few weeks before their full-length, Gallowsbird's Bark arrived. Their live show is a mix of folk and electro, and they tend to play songs in a series of three. I was able to check them out on their West Coast tour at the end of January. This included several sold out shows supporting Ted Leo and The Pharmacists. You should definitely check them out. AL: How do you feel today? Eleanor: A little tired and grumpy. Matthew: Good. It's very nice weather in San Francisco. It's very pretty here. Eleanor: Free Williamsburg is that online thing? AL: Yeah. We did The Hipster Handbook last year. Eleanor: Our drummer Dan really likes it. He was talking about The Hipster Handbook the other day. AL: You played the Rough Trade show with The Kills and Adam Green in New York. How was that?Eleanor: That was fun. Matthew: We played with Adam Green in London too. AL: There was a Rough Trade show in London too around the same time? Matthew: Eleanor had a great time that night especially. Eleanor: Yeah. I had disasters both nights. AL: What are we talking about? Eleanor: I got very emotional. I got drunk. I was crying. Matthew: She got in a big fight with people. Not with me though. AL: Was it a heckler? Eleanor: No! It was very silly. I won't talk about it. All the shows were a great success. AL: Do you get nervous before a show? Eleanor: No, this happened after the show.Matthew: It was accidental. Eleanor: Yeah, that is for sure. AL: How long have you been playing? Matthew has been in several bands before? Matthew: I might as well not have been in any bands before. For how much people heard us, and how good we were, and how much I learned, which was nothing. This is Eleanor's first band. AL: When did you start playing together as Fiery Furnaces? Eleanor: The first time we played in New York was in November 2000. We played at Enid's. A year later we were playing at Bowery Ballroom. Matthew: We would play with just the two of us. Then we played with just one drummer. We had another drummer. AL: Had you been in New York for a while? Eleanor: I had moved to New York in 2000. Matthew: I moved there at the end of 2000. AL: How did you get the gig at Enid's? Eleanor: A friend was Djing there. They had set up a show there. We were the middle act. AL: So many of these songs that are on the first album were written a while ago? Matthew: Pretty much. The last song "We Got Back The Plague" was written at the end. It was topical. It was written after the record was meant to be made. But it took us so long to mix the record. We recorded the album in August 2002, but we didn't finish it till January 2003. We had all the songs together for a while. Matthew: How do we do it Eleanor? Eleanor: Matt and I have different methods. I don't have a method. AL: Are you equal songwriters? Eleanor: I wouldn't say that. On our first album maybe. Matthew: We wrote songs separately and together. It's a nice half and half thing. In general, I have a bunch of songs. I have more songs than Eleanor. AL: Did you write lyrics or music first? Eleanor: I had the words for "I'm Gonna Run." I wrote them while I was working. Matt and I got together that evening. He played a riff on the guitar and we put the song together. AL: So you made up some chords in your bedroom? Did you have a four-track recorder? Matthew: We were sitting in her bedroom. These songs were not written on a four-track. The songs that we wrote together: Eleanor had some words written on some paper. It was often some overheard conversation heard at the office. I would say, "I like this bit and that bit." And she would say, "I like that bit too." We would figure out who would play what. Eleanor would try to sing the words over it. She would do it on her own or I would suggest a way to do it. It was a very normal teenage way of desperately trying to write a song. This record is a very happy experience because we worked on it together. AL: Do you feel strange singing someone else's lyrics? Eleanor: No, not at all. He doesn't write about personal things. AL: Some of the lyrics seem like there was an almanac nearby? Matthew: I have memorized the almanac. Many of the songs with place-names are Eleanor's. They are her personal songs. "South Is Only A Home" are all Eleanor's lyrics. That is all about her life and her Swedish friend in London. AL: Did you experiment more live or in the studio with the songs? Matthew: We had these songs that we had made up or had been playing. Eleanor had written "Tropical Ice-Land" and I had written "Up In The North." Those are the songs we had been messing with them together. We had played them live. When we recorded them, I had some ideas about how we were going to do it. Those ideas were based on my years of making horrible bad songs in basements and trying to put them over. The record had nothing to do with how we played live. AL: You went into the studio with an open mind? Matthew: We planned it out. I wrote it out. I should it to Eleanor. In the studio my mind would be wandering and I would forget to do things. Eleanor would remind me to do something. The record turned out almost as we intended it. AL: Did you record any of the record as a live band? Eleanor: There were a lot of overdubs. But on most of the songs Matt and I were playing guitars, and Ryan Sawyer was playing the drums, and I would do a scratch vocal. In some cases we kept the scratch vocal and that is the take. Then we would do the bass, keyboards, and the real vocal. When we did "Asthma Attack" that was a scratch vocal because we didn't have any time. It was a good enough. Matthew: "Leaky Tunnel" is also a scratch vocal. All the guitar in the first part that you hear in the background is from the vocal microphone. We only had three days to do it. AL: Are you the producer of the record? Matthew: Yeah. I am the producer. They are all my arrangements. Nicolas Verhnes was really good. He was working in the studio with me. He was a good audience. AL: He didn't tell you what to do? Matthew: He miked the drums. I didn't have any ideas about that. I have to give him the credit. There is a lot of drum overdubs. AL: Does anyone in your family play music? Eleanor: Our grandmother is a musician and a choir director at a church. She always wanted us to sing. But we would sit in the balcony. It was a Greek Orthodox Church. Matthew: I like The Who especially. They are famous. With this record and what we play live is not like this. But hopefully we will one day do a meandering light record, and then, as a live band you play it as aggressive as possible. I like that vibe. AL: On this tour you play songs from this album and a few new songs. Eleanor: Yeah. Our next record is coming out in May. Matthew: We just finished it a month ago. It's called Blueberry Boat. That record is more like The Who. It's in the line of the 1966-68 Who where you have these long songs like "A Quick One." AL: Do you have a lot of synths? Matthew: I have an Italian synth that I bought in Illinois for seventy dollars. It's an imitation mini-moog. There is a drone on "Leaky Tunnel." It's sounds like cliché 1971 synth noise. AL: You like a lot of different textures and things going on? Matthew: I like The Who's Quadraphenia. I like Stevie Wonder's stuff he did in that time. AL: Do you like recording or playing live better? Eleanor: Matt doesn't seem to like either. I like playing live for the people. AL: What are your hobbies outside of music? Eleanor: (laughter) Right now I don't do anything very interesting. AL: Did you go to school in New York? Eleanor: No, I went to college in Austin, Texas. I like to cook a lot, but I haven't done anything. Matthew: I like to buy dictionaries. I bought a Japanese/English dictionary. Eleanor: I just read The Prime of Miss Jean Brodie. Matthew: I read The French by Theodore Zelden. It's about the France from 1848 to 1945. He wrote a popular thing that was a pseudo-sociological. He's a serious historian. AL: What is the plan for 2004? Eleanor: We are going to be touring non-stop. We have a plan to do things until September. Matthew: We are trying to get people to like us. It's a hard job. We want to play better. AL: Who is playing with you now? Matthew: We have been playing with Toshi for a while. He plays bass and keyboards. Dan is our drummer for just the past few weeks. Eleanor: We are playing in America and Europe this Spring. We have played a bunch of shows with Hot Hot Heat and Franz Ferdinand last time we were in Europe. AL: Are there any other bands that you played with who were good? Eleanor: We played with Sleater-Kinney. They were good. Matthew: We have also played with Quasi and Hella. Eleanor: We need it. We need business and relationship advice. AL: How did you learn how to do that? Eleanor: I didn't obviously. Have you seen the website? Eleanor: I found a tutorial on the web. I was too lazy to find a book. AL: Have you seen any good movies? Eleanor: We have been flying on planes so much. That is where I see most films now. Matthew: I saw All The President's Men. That was great. Jason Robards was especially good. I saw Dog Day Afternoon when we were in England. It was nice. AL: It has that gender bender thing going on. Matthew: It's mostly all about working up a sweat. I like Serpico. AL: So you like anything with Al Pacino? Matthew: Not really. I like all the stuff from the 1970s. I like all the cars and the street signs. Eleanor: I saw the most recent Woody Allen film. That was terrible. AL: Do you collect anything? Matthew: Books. Anything thing with funny words. Eleanor: I don't have a place to live so I have gotten rid of almost everything. It's a nice feeling.